Buy a safety managers mailing list to start emailing, calling, or sending direct mail to potential sales leads in minutes! Our safety managers email list is sorted by job title, containing only those with management positions such as "safety director" or "manager of safety". Safety directors have an important job: These professionals help establish and ensure compliance with workplace safety rules and regulations. Safety managers also conduct inspections of work areas to find and remedy unsafe situations and unsafe worker conduct, and they are often called upon to maintain records showing compliance with safety regulations. When it comes to preventing on-the-job injuries and addressing workplace safety, directors of safety are the ones who are held responsible, so it's important that they have all of the tools they need to do their jobs effectively. If your business has a solution that can help, contact these important sales leads with our safety manager email database. 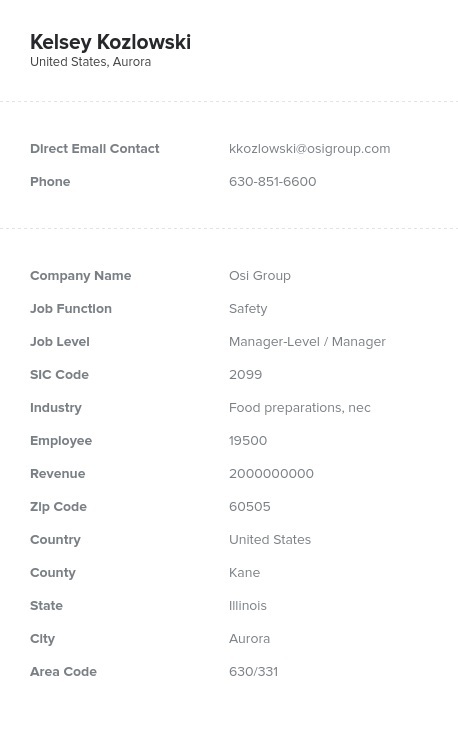 Our pre-built B2B safety directors email list contains the verified contact information you need to carry out any type of marketing campaign. Use the mailing addresses featured in this business contact database for a direct mail campaign. Focus on calling with accurate phone numbers of managers of safety at companies across the country. And keep your brand's message safe from the black hole of generic email inboxes thanks to the direct, accurate email addresses you'll get when you buy a directory of email leads from Bookyourdata.com. For a more old-school marketing approach, you could also contact a director of safety by fax; we include fax numbers in our business contact lists, too. Download our safety manager mailing list today and see what having real, targeted contact information can do for your marketing efforts!